We're feeling rather piqued because we'll have some absolutely intriguing and delicious Spanish wines open for our tasting with Vineyard Road. 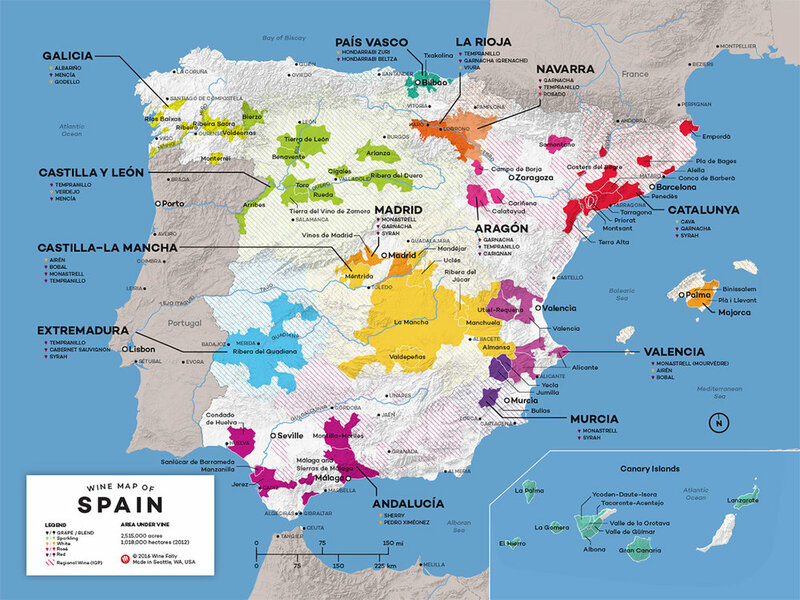 Most of us were introduced to Spanish wines through the likes of big bold Rioja or the effortlessly delightful Albariño but there's plenty of small wine-making regions (Denominación de Origen) that fascinate our inner wine geek. There's Ribera Sacra, The Canary Islands, Priorat, a little over 70 in all, though we're focused on Castilla y León, Ribera Del Duero, Ribeiro, and Rías Baixas. Alfredo Maestro is one of the more intriguing up-and-coming producers in Spain today. Originally from the small village of Peñafiel in RIbera Del Duero, Maestro wanted to compose elegant wines from forgotten vineyards and sought out forgotten parcels, retraining the vines when needed, and making the wine in a natural fashion. That's certainly the case for Amanda an absolutely breathtaking rosé made from Garnacha Tintorera (better known as Alicante Bouschet) from a 60 year old single vineyard named "El Cuchillejo" located some 850 meters above sea level. Due to the extreme nature of the vineyard, and the small source, there are only 750 bottles produced in a vintage, and we're already pining for the next one. Nothing quite prepares you for the other wine that we're featuring from Maestro, El Rey Del Glam. This freaky 100% Granacha is an organic cuvee, split between two vineyards. The first is not far from "El Cuchillejo" in Peñafiel at some 700 meters but the second vineyard is found in the Sierra de Gredos mountain range in the province of Avila northwest of Madrid at extremely high elevations (1,100 meters!). Best enjoyed with a slight chill, El Rey Del Glam (The King of Glam) is both a cheeky reference to a song done by the Spanish group Dinarama + Alaska) and an homage to the country wines of Spain's past, where drinkability reigned supreme. Of course, we would be remiss to not include Spanish whites. Famously known for their refreshing qualities, we find ourselves in Galicia, Spain. Here you find both Rías Baixas and Ribeiro. From the former we have La Val, a beautiful Albariño and from the latter we have Adega Eloi Lorenzo Ribeiro Blanco Villa Paz, a sublime blend of whites including Treixadura, Albariño, Loureira, and a pinch of Caiño Blanco. As natural as finding the rain in Spain on the plain (mainly), we're serving the 1605 Manchego from La Mancha and Fermin Paleta Iberico Jamón. Rob from Vineyard Road exemplifies the term consummate professional. Exceptionally gracious and bespoke, he's one of our favorite wine reps.